On December 8, when the whole Church celebrates the Feast of the Immaculate Conception of the Blessed Mother, my mind goes back to my first visit to the beautiful shrine of Lourdes tucked in the Pyrenees Mountains on the French-Spanish border. When I first visited Lourdes in 1978 as a university student at the end of a summer study program in Brittany, France, I volunteered my time as a “brancardier”, transporting many sick people from the “Accueils” to the grotto and the healing baths. I discovered then an extraordinary story that still remains hidden from many in the world today, especially in North America. The Grotto of the Apparitions where Bernadette encountered the Mother of the Lord is truly holy ground. Each time I have returned to Lourdes, I appreciated more and more that holy ground. This little town is one of the most well known pilgrimage sites in the Catholic world. 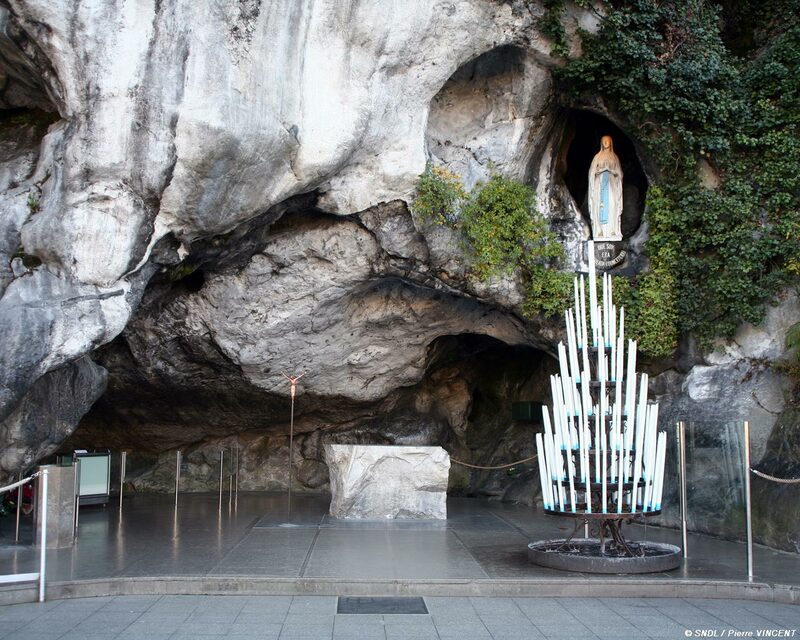 Though hidden in a corner of France, Lourdes has a universal vocation of all of humanity. It has lived this vocation since 1858 when Mary of Nazareth, herself a model of discretion and humility sought out another of her humble sisters in faith, Bernadette Soubirous. Both Mary and Bernadette were sent by God, each in their own time and places, to bear a message of hope to waiting humanity. Even the initial skepticism of the local church authorities served as a time of purification of the great message of Lourdes that continues to resound throughout the world. Lourdes is a constant invitation to humanity that we are pilgrims on a journey of faith. At Lourdes, Mary revealed herself to the peasant girl, Bernadette with the words: “Que soy era Immaculada Conceptiou,” spoken in the local dialect of the girl (neither French nor Spanish, but Provencal), that translates “I am the Immaculate Conception. The Immaculate Conception is a complex dogma that has interested theologians more than the ordinary faithful. Many people still wrongly assume that the Immaculate Conception refers to the conception of Christ. In fact, it refers to the belief that Mary, by special divine favor, was without sin from the moment she was conceived. The main stumbling block for many Catholics is original sin. Today we are simply less and less aware of original sin. And without that awareness, the Immaculate Conception makes no sense. Through the dogma of the Immaculate Conception, God was present and moving in Mary’s life from the earliest moments. God’s grace is greater than sin; it overpowers sin and death. When we honour the Mother of God under the title “Immaculate Conception”, we recognize in her a model of purity, innocence, trust, childlike curiosity, reverence, and respect, living peacefully alongside a mature awareness that life isn’t simple. It’s rare to find both reverence and sophistication, idealism and realism, purity, innocence and passion, inside the same person as we find in Mary. Something inside us yearns always for innocence, purity, freshness and trust. If we lose these, we find ourselves cynical and disillusioned with an unhappiness that comes precisely from having been around, from having had our eyes opened, from having knowledge without innocence. We need to hold that innocence and experience in a proper tension. Mary, Mother of the Lord teaches us how to do just that. In Mary we have an image of humanity and divinity at home. God is indeed comfortable in our presence and we in God’s. Tourists pass quickly through places, but the places pass slowly through pilgrims, leaving them forever changed. I am one of those grateful pilgrims to Lourdes, whose life was changed, and continues to be changed when I visit that holy place. As we celebrate Mary under the title of “Immaculate Conception,” let us give thanks to God for the graces, blessings, messages and meaning of Lourdes. They continue to work with many miracles throughout the world today.